Expert tells AsiaNews about the consequences of the Chinese-funded project, which violates Environmental Impact Assessment rules. Sand and granite mining are destroying the local coral reef and marine life, as well as the livelihood of 30,000 fishermen. Beachfront erosion will likely cause damages to coastal houses and hotels as well. Colombo (AsiaNews) – The new Colombo Port City should be scrapped because the “sovereign, economic, social and environmental costs of the project far outweigh whatever benefits” it might bring, this according to a public tribunal hosted by anti-corruption watchdog Transparency International Sri Lanka (TIS), which is opposed to the project funded by the China Communications Construction Company Limited (CCCCL). Construction is currently halted, but fishermen and activists with the People's Movement against the Port City Project are concerned that the government might backtrack on its promise to shelve the project and allow work to resume. Below, we publish an analysis by environmentalist Sajeewa Chamikara, who is the director of Environment Conservation Trust. In it, he describes the damages caused by the construction of the port city. Excavation goes on all day in the Thamba Gala area. The sand extracted from the site is taken to the construction site – 7 kilometres away – in three ships. No fishing is allowed near the areas of excavation and transport, affecting 30,000 coastal fishermen. In the last three months, the fishermen who work near the project have lost fishing equipment worth 4 million rupees (US$ 30,000) due to damages. The fishermen also have to respect a 10-km no-go zone near Thamba Gala although this is a high-yield fishing area. Due to the sand excavation, sediments have been stirred; this has led to the destruction of a number of fish spawning areas. Fishermen have already noted a decline in fish stock, incurring in major financial losses in Negombo, Wennappuwa, Uswetakeiyawa, Hendala, Panadura, Wellawatte, Mount Lavinia, and Moratuwa. As revenues for coastal families dwindle, social issues develop. According to the initial plan, 30 million cubic metres of sand was needed. However, since the project has expanded, the required quantity of sand has drastically increased. Considering the damage already done by sand mining, the extent of environmental degradation is unimaginable if the project is fully implemented. In view of massive sand excavation, rocky reefs, coral reefs and sand dunes are increasingly at risk of being washed out or become unstable. Since fish and other aquatic species spawn in reefs, this will likely have a negative impact on these species. It will also destroy the livelihood of thousands of fishermen, and affect nutritional levels in the country, as fish is the main source of protein for many Sri Lankans. About 16 million cubic metres of granite are also needed for the reclamation process. There is no mention in the Environmental Impact Assessment (EIA) report where the project will obtain granite in such a large quantity, of the ecological impact of excavating the granite or the inconvenience caused to the people living in the vicinity of granite mines in the Western Province. Many quarry owners are already violating the terms of their licenses, excavating ever-larger quantities of granite, because of the insatiable demand for granite from the Port City. Over-exploitation of granite resources has caused grave inconveniences for those who live near the quarries. By attempting to excavate this vast quantity of granite, the geology of the country will be destabilised, leading to increased natural disasters in sensitive areas. Sri Lanka has already seen an increase in landslides in the central province due to environmental mismanagement. If granite continues to be excavated on such a large scale in these areas, the entire hill country is at risk of becoming unstable. As granite excavation lowers ground water, this may lead to a shortage in drinking water. There is already high demand for granite for a number of development projects in the country. This demand will only increase in the future. After reclamation work for the project is completed, large buildings need to be erected at the Port City. These buildings will require yet more massive quantities of granite. This will automatically lead to over-exploitation of granite, which will destabilise the entire country and lead Sri Lanka to natural disasters on unimaginable scales. There are many recent examples of this from other parts of Sri Lanka. For example, by expanding the Colombo Port, the Dikowita fishing harbour is continuously filled with sand, greatly affecting the operations of the fishing harbour. More recently, media attention has focused on breakwater constructed near the Unawatuna Beach. At only 300 metres long and only one metre high, this breakwater has been blamed for a dramatic increase in erosion of a large stretch of the beach, famous among tourists. A similar fate befell the coral reefs of Hikkaduwa when a small jetty was built further along the coast. However, the Environmental Impact Assessment report says nothing about these probable consequences. In the opinion of many coastal residents, the Port City Project has already exacerbated coastal erosion. 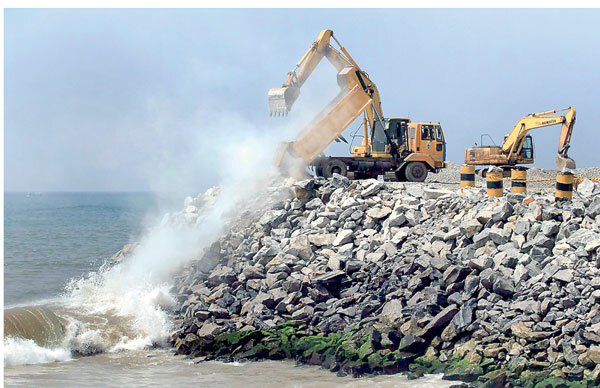 Areas to the south of the project, including Panadura and Beruwala, and to the north, including Uswetakeiyawa and Negombo, are facing serious coastal erosion. These are highly densely populated urban areas, with large numbers of houses, hotels and restaurants close to the beach. When the beachfront is reduced, it adversely affects the tourism and fishing industries, as well as the communities living along the coast. The setbacks suffered by these industries will affect the entire economy and will lead to various social problems. Kelani River carries a significant increase of sediment from Modara when entering the ocean. Sediments pour in a natural way into the sea and are carried by currents along the coast into shallower water. This area has the best places for crab and lobster fishing. Changing currents will threaten the survival of these species and, consequently, hit fishermen who catch crabs and lobsters for hotels. When one attempts to reclaim seas to create artificial islands, there is significant damage to aquatic ecosystems even when proper procedures are followed. When the United Arab Emirates created the Palm Islands, construction seriously affected aquatic eco systems. If this can happened when proper EIA procedures are followed, one simply cannot imagine the extent of the damage that will be caused by the Colombo Port City project, which did not follow EIA procedures at all. Due to our continuing protests, Sri Lanka’s new prime minister promised the nation that the Port City project would be terminated when they were elected to power. However, we are concerned that this promise will not be kept. China Communications Construction Company Limited plans to invest US$ 1.4 billion in this project. It is the largest Chinese investment in Sri Lanka. There are ominous signs. It seems that the new government is beginning to attempt to justify the project, even though activities have been suspended. We continue to insist – as we did before the elections – that the project is completely illegal, that the actual sovereign, economic, social and environmental costs of the project far outweigh whatever benefits its backers claim. The truth is that, even though less than 1 per cent of the project has been completed, the damage to the environment is already unacceptable. What must be done is to end this fraudulent, illegal and wholly unnecessary project. The nation's laws permit and demand this. We call on the government to dismantle systematically what has already been built since work began in January, and use the recovered materials to protect and restore the areas affected by coastal erosion, under the supervision of the Coast Conservation Department.